I can’t believe summer is ending – and apparently neither can the writers of “Pretty Little Liars.” Again, I have too many questions and far from enough answers after this penultimate episode of Season 5A. Well, the original four liars finally decide to come clean to the police. “After this, Ali is on her own,” Spencer says. But it can’t be that easy, can it? Of course not. Suddenly, Ali appears on all the TVs in a window near the police station – presumably “A’s” doing – and they decide they can’t tell because no one will believe they didn’t know Ali was alive. …because she went to the movies with her father, brother and MONA, whose relationship with Mike has randomly resurfaced. This leads to a confrontation between Aria and Mona: “He deserves someone nice which I’m not,” Mona says about Mike. 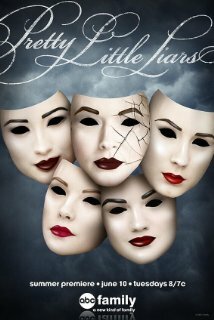 “Maybe I should’ve just died off that cliff.” “Mona don’t say that don’t ever say that,” Aria surprisingly yells back at her. Mona then alludes she knows something about New York. Meanwhile, Hanna is having trouble connecting with Caleb, so she asks Spencer to get Toby involved to get through to him, man-to-man, which sort of backfires. Caleb isn’t the same person he was before Ravenswood. “Who died and made you Oprah,” Caleb asks of Toby. Hanna pleads with Caleb, “If you love someone you should be able to tell them anything.” Caleb later tells Hanna the Ravenswood story, and Hanna reassures him, “I didn’t come this far not to have a happy ending.” Let’s remember that they are all high school age. Anyway, the ouija board creepily then moves to “goodbye.” Gulp. OK, this is the biggest plot development. Spencer learns the secret Melissa and her father are hiding through a video diary Melissa left. Melissa saw Spencer the night Alison disappeared with a shovel in her hand. “What’s the line from ‘The Tempest?’ This Island is full of noises.” She said she thought Spencer killed Alison with that shovel so she pushed her in and covered it up, she didn’t want anyone to know. Now she knows it wasn’t Alison, and she wasn’t dead when she buried her. She was a stranger and she buried her alive because she thought she was protecting her sister. “There’s a point where you go from survivor to predator.” AH. Spencer shows the video to Emily and Aria, and they deduce someone had the idea for Bethany to take Ali’s place – how else would Bethany and Ali be wearing the same clothes? Meanwhile, Tanner wants to know if the girls knew who killed Bethany Young, and later wants to speak with Byron, who points out she’s breaking the rules talking to girls without parents present (hasn’t this happened before?). She says that homicide investigations “tend to get less complicated” – lady what show are you even on? And one girl wants to talk to Tanner – but who? !